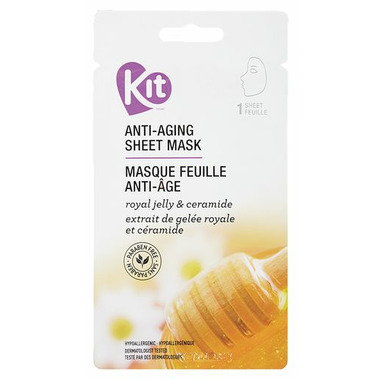 KIT Anti-Aging Sheet Mask features royal jelly and ceramide, known for their anti-aging and anti-inflammatory properties. This mask will help replenish the natural lipids that are lost from exposure to harsh environmental factors, use of drying products and during the natural aging process. Ingredients: Aqua, Glycerin, Butylene Glycol, PVP, Betaine, Glycereth-26, Polysorbate 80, Tea-Cocoyl Glutamate, Caprylic/Capric Triglyceride, Xanthan Gum, Phenoxyethanol, Caprylyl Glyceryl Ether, Cyclopentasiloxane, Cyclohexasiloxane, Hydrogenated Lecithin, Caviar Extract, Ceramide 3, Cholesterol, Propanediol, Royal Jelly Extract, Adansonia Digitata Pulp Extract, Nelumbo Nucifera Flower Extract, Prunus Mume Fruit Extract, Adenosine, Dipotassium Glycyrrhizate, Disodium EDTA, Gaultheria Procumbens (Wintergreen) Leaf Extract, Hydrolyzed Collagen, Sodium Hyaluronate, Sodium Hydroxide, Parfum. Use only as directed. For external use only. Keep out of reach of children. Natural ingredients may vary in colour. This was actually quite nice! it stings a little on first application but that dissipates quickly. It has a super cooling effect after you take it off. skin feels firmer, refreshed and cool! my only qualm with this is that it requires a better quality sheet that holds more of the serum. I will be re-ordering this. This brandâ€™s masks are actually pretty good. I bought a few different kinds and was pleasantly surprised when I used them. They worked. My skin looked better afterwards. Would buy again.